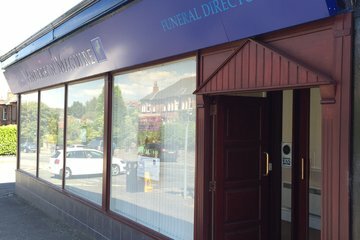 Compare funeral directors in Williamwood and read verified reviews on the UK’s online funeral resource. Use Funeral Zone Listings to find local funeral directors in Williamwood that meet your specific needs. You can organise the search results by ‘best rated’, 'nearest' or ‘most reviewed’. There is also a handy Google Maps feature so you can see exactly where each funeral home is in relation to each other. Ishbel and Juliette made the funeral very easy to arrange at a difficult time. Their experience and suggestions made for wise decision making and my Father had a very dignified send off. I am grateful for their help. The flowers were chosen through Anderson Maguire and were superb. Martin ensured the funeral went smoothly and Chris, the driver, was very attentive. The orderof service was printed to a very high standard. I would like to thank all the staff at Anderson Maguire for their care and service to my aunt's funeral. it was very much appreciated. Everything was first class on the day. The family were very pleased and couldn’t have asked for more. Juliet and Ishbel were both very kind, compassionate and professional throughout planning and organising my dad’s funeral. They were helpful with things we wanted to do, nothing was too much for them. On the day of the viewing Juliet gave my family enough time to say goodbye to my dad. My dad looked very peaceful and smart in his suit. I would like to thank whoever prepared him. The day of the funeral itself went well and the undertakers, John and Aiden were very kind and professional at all times. John at Linn Crematorium was very helpful in the photo tribute we wanted.